We’ve been told that life is boring if you don’t take any risks. And while that may be true, when it comes to fashion, it’s not just about taking risks – it’s about takingcalculated risks. If you want to take a little trip on the wild side, then have a look at our guide of risky fashion trends for men and how to efficiently pull them off. Who doesn’t love a good print? It’s versatile and one of the easiest ways to create a statement about who you are and what kind of fashion you love. Generally, the print trend is widely seen in shirts and jackets, but from what we’ve seen on recent runways, printed trousers have now become the next best thing, with floral prints having major prominence in the fashion scene. So how do we pull off this emerging trend? Think along the lines of ying and yang – that is, choose shirts, jackets and accessories that complement the eccentricity of the pants. This means don’t pair the printed pants with anything else that’s printed, for example floral t-shirts or striped jackets. Adding more patterns to the ensemble is an absolute no go. Instead, opt for simplicity. 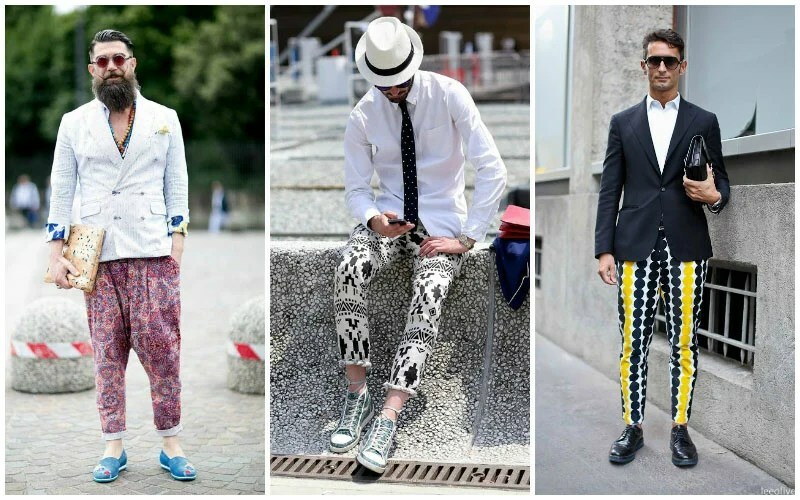 We have to remember that printed pants are very eye catching. Therefore using a plain coloured shirt or jacket provides a nice balance with the bold new trend. This kind of contrast accentuates the unique nature of the printed pants, rather than fighting against it. What results is sophisticated chic without any overstated overkill. With spring almost upon us, you might as well start the season with a pop of colour! Bright yellow jackets are a perfect start but beware, its a risky choice. However with that said, you just need to know how to pull it off properly. Despite it being a risky choice, we here at TheTrendSpotter love it nonetheless. Why? Because yellow is one of those colours that are remarkably dramatic and eye-catching, not to mention it has a variety of hues to work with. If you decide that sporting a bright yellow jacket is totally going to be your new thing, then listen carefully. In one complete ensemble, it’s a general notion that you should only use one bright colour to stand out. 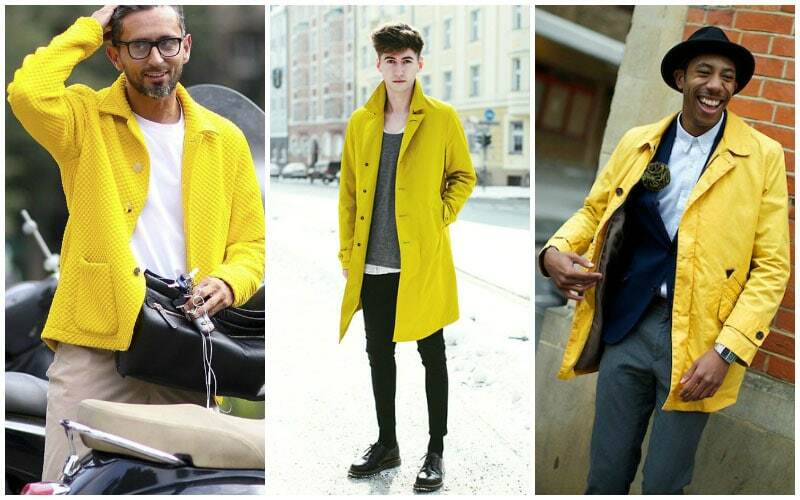 Hence, should you decide to use a bright yellow jacket, there should be no other dramatically bright colour on your outfit. But that’s not to say colours like orange and blue are out of the question. This is where the concept of darker hues come in. What we mean is don’t completely disregard other bright colours – instead, just choose darker shades of them. In saying that however, the easiest way to pull off this look is to use block colours. For example, a black shirt is a perfect way of pulling off this trend due to the stark contrast both colours provide each other. White is also another colour to consider as the colour is quite neutral and can be used in many clothing combinations. As we are all aware, colour is big, and pastels have been a prominent trend in recent runways. Many men still don’t consider colours as a major component in their ensembles collections, but if the recent runways have told us anything, it’s that the pastel trend is going nowhere but up. 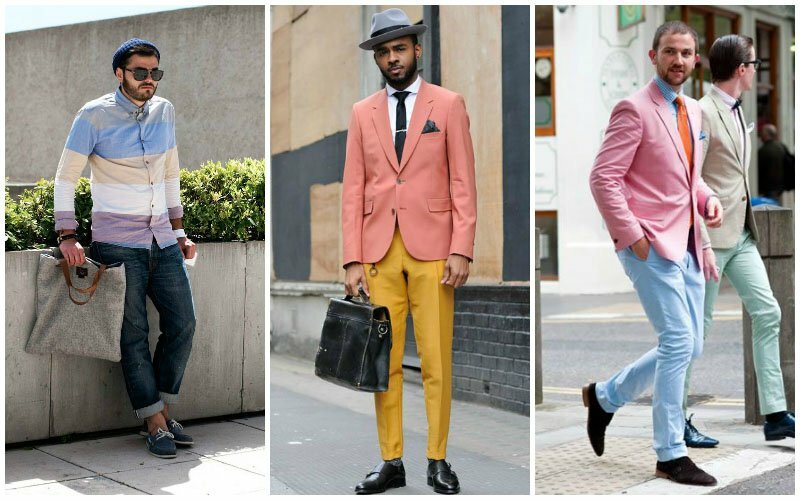 So whether you like it or not gents, eventually pastels are going to make it into your wardrobe. Generally, there are two types to this trend. The first is the bleached, subtle pastel trend. This is the easier of the two as its style makes it easier to blend with other clothing regardless of colour. Light pastel colours like blue, green, or even pink would work great with a simple white shirt and a decent pair of chino pants. But the best way to pull off pastels is to hint at it rather than highlight, therefore a bolder tone is recommended as the ideal finisher. Think along the lines of dark blue blazer or a patterned shirt if you’re wearing pastel colored shorts/pants. Meanwhile, at the other end of the spectrum we have bold pastels. These are pastels that are significantly darker to its subtler counterparts. For those really wanting to a risk in fashion, this just might be for you. Having a blazer, whether bright or dark, paired with a block colour tie is the easiest way to pull off this look. In this instance, using bold against bold pastel won’t truly harm the ensemble. But in saying that, one needs to remember the golden rule of contrast. So we recommend that if you going to use, say for example a dark blue or maroone blazer, then have the pastel colour on the pants as opposed to the shirt. That way both elements are significantly accentuated, the contrast providing an even balance between the two components.